The premise is precedent. Space is not a neutral field against which the societal is randomly played out. Space is more than a mere reflection of independent and discrete socio-economic and cultural variables. 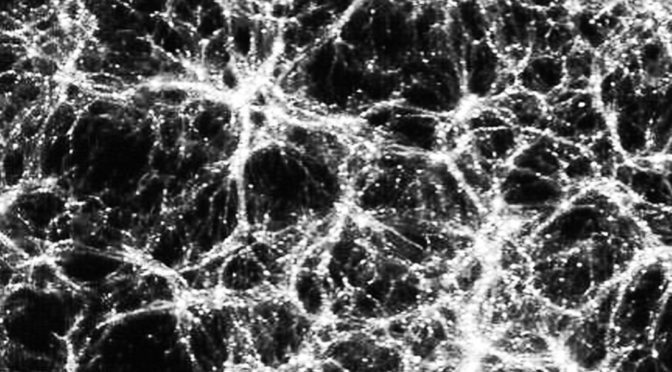 It is a living organism, constructed piece-by-piece as a machine for living, seeing, and being that has achieved its own particular form of consciousness, a spark of life more than the sum of its parts and more than the parts contributing to the Corpus Spatium. For too long, knowledge of space has been characterized by apathy, obscurely a superficial reaction against the heroic Modernists but really a deep, substantive fear of constructing knowledge and understanding, of releasing inhibitions that continue to reward failure, keeping food on the table as opposed to providing nutrition for the soul. The hypocrite’s feast is the city’s famine. Knowledge has been stagnant, without evolution, to the point where the vocal heretics now call for revolution. Space is both dependent and independent, a variable mixture of cause, effect, and react that demands our evaluation and our respect. Without so, we diminish the most valuable commodity the city has to offer, in exchange for our empathy it can provide rewards beyond imagining, of happenstance and serendipity, of casual encounter, of formal beginnings, and a lifetime of companions to share the journey with us. When we view the space of the city as a neutral variable, we devalue the beingness of the city as an object of analysis and curiosity. Our knowledge becomes tainted with a paralysis that is both confiding and liberating, imprisoned within dogma and freed of moral or ethical consequences. The game is played with the chess pieces but the board sets the parameters of the rules. Our cities thus have become lawless, without rules catering to the urban object but in service to the greed of the self. When we view the space of the city as isotropic, we artificially impose uniformity where it does not manifestly exist. 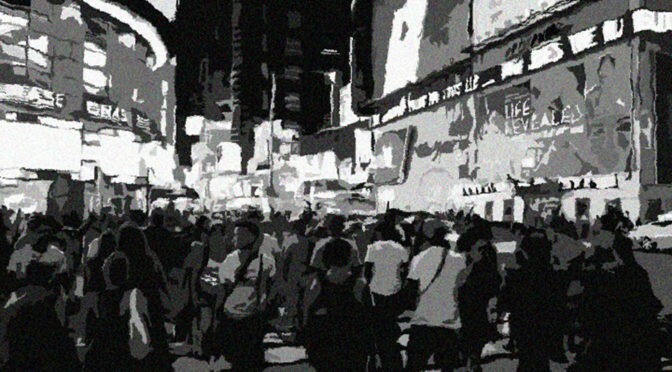 We attempt to impose rather than derive meaning from city places. It is a fallacy. We inflate the importance of individual action and deflate the status of collective significance without really comprehending either whilst the kinetic and potential energy of urban space becomes lost in a primordial soup of fashionable theory. Actuality and potentially are ignored at its peril, and we become lost in a uniform monstrosity of development patterns that ‘follow the rules’ but want for a logical existence. When we view the space of the city as mere reflection we judge through a mirror darkly. We assign a value lacking any quantity. We concede quality without calculation. The city more than reflects, it embodies. It consumes and births, it is nurture and nature surely melted, an elegant synthesis of meaning where past and future are simultaneously read and written into a spatial harmony. 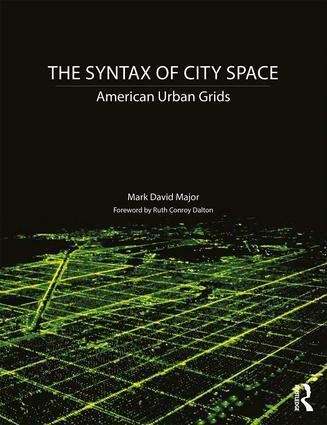 The space of the city is a systematic thing and we are the blood coursing through the veins of its streets, both sustaining of and existing at its heart. There is a logic to its arrangement and an organization to its reason for being. Space is alive and lives within and without in the city. Antecedens est, est exemplum. 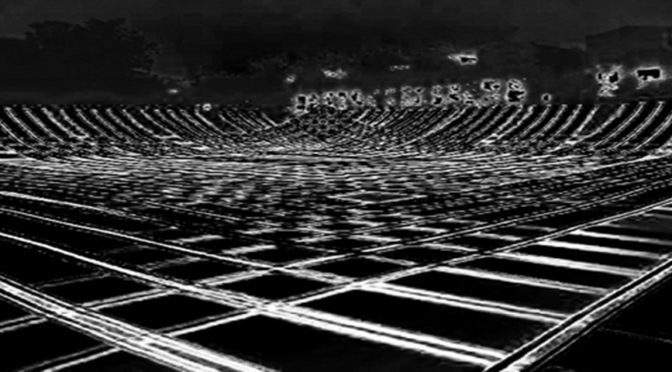 The geometrical city exists in and across time and space, a quantitative and describable pattern finitely persistent in its stability and infinitely malleable in its qualitative flexibility. The spatial geometry of the city flows, never halting and without beginning, it merges together into an intricate network of limitless possibilities and strategic offerings that guide the weary traveler to his destination. It is a tradition rooted in the instinctive nature of our being, stretching back into shadowy mists of the past and striding forward into the enchanted light of a promised future, bounded by the essential truth of living on a tiny sphere floating, awashed at the edges of a universal shore. The geometric city is the hearth of the community, the fertile land gathers around it, providing both sustenance to and sustaining from the urban ideal. At its center lies a sacred space, a place to gather for all, where insider and outsider mingle and exchange freely of their valued time and goods. This is the true Pilgrims’ pride of America, that which can be independently traced to worlds and cultures of Antiquity from east to west, south to north, following the path we emerged from African jungles to cross plains and rivers, the mountains and oceans. The geometrical city is the economy of the community, goods and services are exchanged in space and carried forth into the larger, unfamiliar world. It welcomes and reassures, it is questions with answers, offering solvable riddles to the observant and the observed. 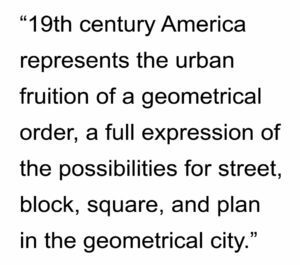 19th century America represents the urban fruition of a geometrical order, a full expression of the possibilities for street, block, square, and plan in the geometrical city. 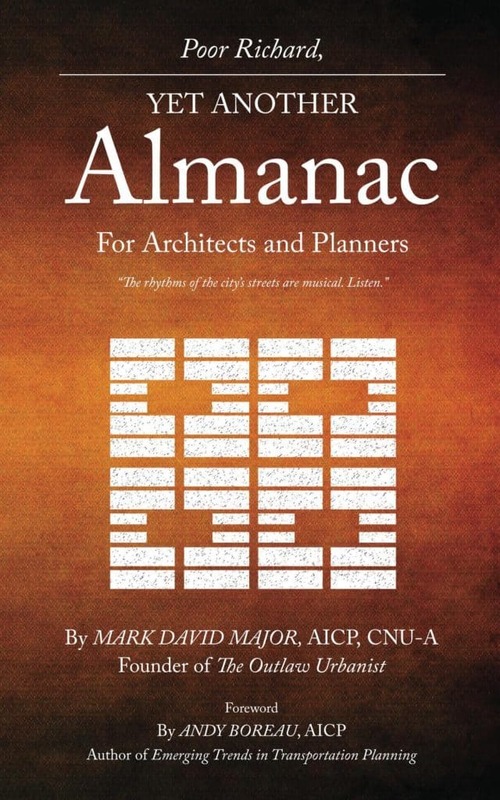 In the virgin land of this milieu, the geometrical city attains its Renaissance ideal, ultimately a Spanish model of the rational city, relentless in its magnificence as a tapestry, woven by individual hands into a common entity, holistic and worthy of an ancestral past from which it sprouted. Until, at last, radial parts emerge from within or reach forth from center-to-edge to bring a structural wonder to the urban spectacle. The formal and informal, planned and unplanned, coincide in the spatial beauty of the rationally urbane, all shaped within a Jeffersonian framework leaving marks on the landscape to this day. 20th century America demands the ruination of the geometric city in its heedless pursuit of state control and private profit; the faceless bureaucrat and masked capitalist hidden beneath self-serving rubrics, all in the name of an artificial (public and personal) welfare, which taunts the instinctive nature of urban dwelling. Stability is exchanged for unpredictability, the malleable for the rigid, the persistent for the ephemeral, and a natural pattern for the awkwardly contrived forever haunted by an unnatural entropy. It is a doctrine that demands more and more at the expense of less and less (quantity and cost) whilst ignoring the concept of the better and the best (quality). It becomes an irrational anti-city. Building transmutes the ideal into the selectively practical. Architecture asserts the hypothetical into creative sensation – of space, of light, of form, of transformation, of shapes frozen and in motion – and the city is born. The architect and planner re-assert the sensory into the theoretical, and the organism of the city is invigorated and renewed. The genesis of this association lies in the imagination of human intellect and the practicality of the human hand. It is not a mysterious alchemy, revealed to only a privileged few. It is a delightful synthesis of the human condition in which we are all are invited to participate. Space is both the medium and crucible of this association. Space surrounds and embeds the condition with meaning – within and extraneous – simultaneously internal and external to the object whilst also being native and foreign to its subject. It is future prologue and past epilogue of the same problem. 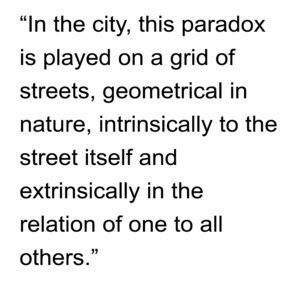 In the city, this paradox is played on a grid of streets, geometrical in nature, intrinsically to the street itself and extrinsically in the relation of one to all others. This nature exists in a continuum, an axis drawn between the extremes of conserved chaos and radical order. 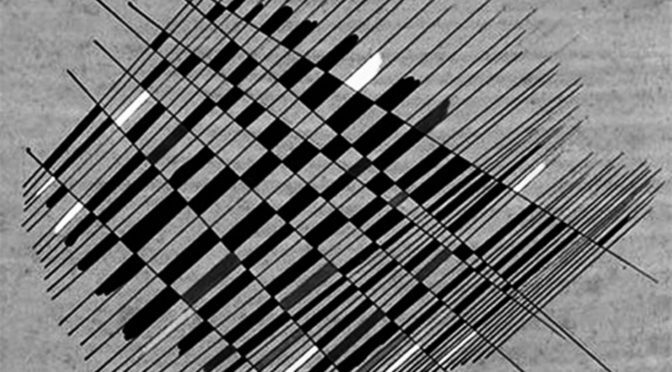 Our errors in comprehending this ordered chaos, what Jane Jacobs once referred to as “organized complexity”, lies within the self-imposed boundaries of our own descriptions. We become limited in describing that which we wish to see instead of observing that which we wish to understand and, in doing so, we become trapped within the tired dogmas of an imagined past and a condemned future. Dogma selects us. We do not choose the doctrine. This often (preferably) occurs independently of curiosity or wisdom and we youthfully mistake its favors as a proclamation that, indeed, we are the anointed one. It is a false image of oneself. Once a single step is taken along this path, we derive words inadequate to the object but sufficient for dogmatic pursuit in a hollow attempt to describe the nature of the city and make the understandable, the objective, into the incomprehensible, the subjective. We move backward and abnegate the hypothetical for the fanciful, the sensory for the material, and theoretical for the dogmatic. In doing so, we attempt to surround ourselves in meaning at the expense of the spatial and the urban. Theory suffocates in the vacuüm of this confrontation, embracing a void that fails the essential, instinctive construction of the city, in service to the super-ego of the individual. The urban loses balance. 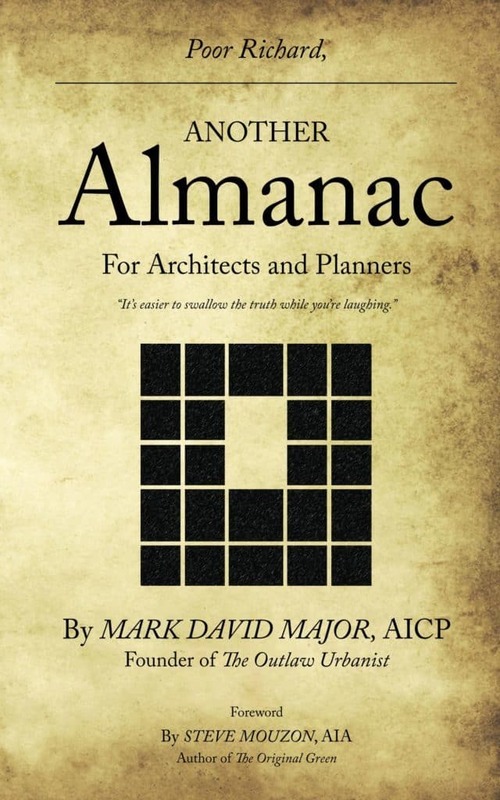 The real nature of the city hides behind a mask, a voice without a face, raising objections to the elementary urbane on shallow grounds of methodological peculiarities, historical reinterpretations, and narrow understandings of the relation between form and function. We must not fear to finally unmask the charlatan to unveil the bodily and mentally sensual to the masses, and declare the sensory city as a subject that is worthy of investigation and a thing demanding objective theory. In this way, the investigative and the theoretical form a synthesis to reveal the functional significance of space. Our words must have the precision and structure of whispers so that our theories carry meaning beyond the lone voice screaming to be heard above the crowd. We are the crowd, and it is our voices that matter. 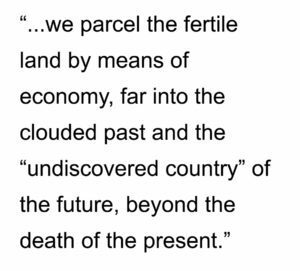 On this basis, we parcel the fertile land by means of economy, far into the clouded past and the “undiscovered country” of the future, beyond the death of the present. From this emerges meaning and function, a city of light and sound, movement and life, each particular in their own way but also a simulacrum of all that has come before and will arrive again. 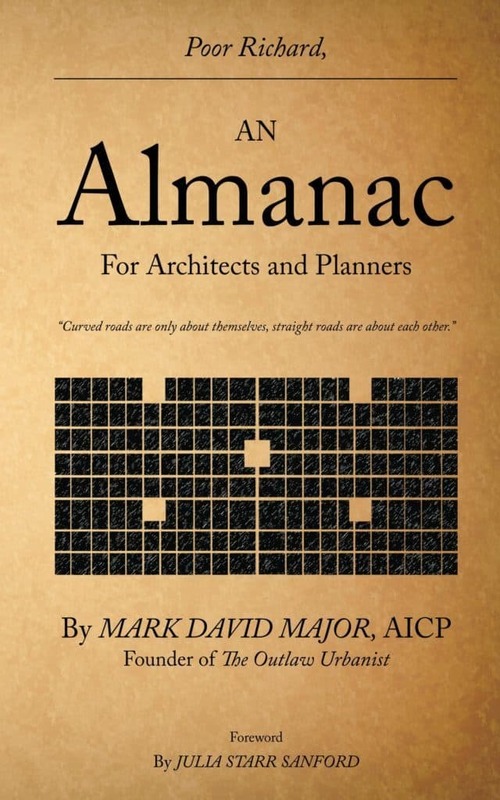 There is power in the disorder of the city and a power of magnitude to be discovered in its orderly manifestation. Neither is greater than the other nor the sum of the parts. Within this (dis)order we live and function, day to day, year to year. We shape and are shaped by the space of the city, we utilize its strategic provisions for seeing, going, and being and its infinite redundancies to pause, understand, reflect, perhaps even decide. The light we shine on the city reflects upon ourselves and, in seeking to better understand the city, we learn to incrementally know ourselves. The city is both static in the moment and dynamic across the seconds. It can be understood all at once but its parts in isolation are – often so – the genesis of intellectual aberration. The organism grows but the machine still operates and we are befuddled. The city is at once process and product, the thing already made and in the process of becoming, the Father seeding the land, the Mother birthing the child, and the child being born, a Trinity upon itself. However, this is not a Mystery of faith but a failure of understanding. We must conjecture, we must believe, we must hypothesize, and we must dissect and reassemble if we hope to intervene with wisdom in the space of the city. Let us delve into Beingness of the city to better understand its nature with hope and expectation instead of fear and trepidation. It is life revealed.